We are proud to be able to offer a Bespoke Log Cabin Service to our customers. Our bespoke service lets you design the right building for your garden and needs. You can choose the size, type, style and any additional features to suit your needs and the garden. A sketch of your log cabin is always helpful – specifying the size – shape, style and key features of your building you would like. You can specify the features for your building – including wall thickness, number of windows, double doors, extra doors, internal walls and style of windows. Please see our bespoke category for some examples. If you see a cabin you like but would like to tweak this design please let us know. We are also able to provide extra’s – such as pressure treated building base – concrete bases - roof and floor insulation kits – heating and cooling pack – electrics – treatments. There is no charge or obligation for creating a quote. Our design team will take your information and will put together an initial quote which will include delivery. Once an order is placed we will provide you with a full set of plans to sign off giving you the chance to make any changes that you may require. Once you have signed off on your plans we will begin to manufacture your cabin. Manufacturer will normally take 4 weeks and a further week to delivery – typically 5 weeks in total. We will deliver your log cabin to your home. Delivery is typically on a hiab and our cabins are easy to build and come with a full fixing kit and instructions. We do also provide an installation service – please speak to one of the team to get a quote. If you start to build your shed and feel that you would like some help – don’t worry – please contact us to get a quote for our install team to come and complete your build of your log-cabin. 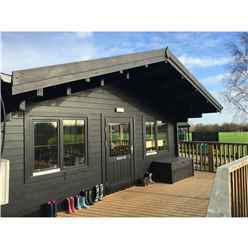 All our bespoke log cabins are made from high quality tongue and groove cladding. The tongue and groove cladding interlocks creating a strong and durable log cabin. We typically offer 34mm, 44mm and 70mm wall thickness and are able to provide twin skinned walls. We only use the highest quality timber when manufacturing your bespoke log cabin. All our log cabins come with a 1 Year Manufacture Warranty.